I got away at a very casual 1300, and headed across the road to an empanada stall, normally when you buy these little delights whether pollo or carne, you get 10 for 30 pesos. Last night I ordered 10, though this time 4 sufficed. The ladies cooking them were on for a chat. Fruit was also bought at one of the few shops open today, Sunday. Argentinos cram their shopping duties into much more relaxing hours that don’t interrupt other things. Riding through towns between 1200 and 1800 almost all shops are closed, the same is for Sundays. They open in the mornings and again from 1800 to19 or 2100. Evening shopping is so much more social and relaxing. The advent of monolithic shopping malls has turned shopping into a generic experience to say the least. A war could be occurring outside and one would not even know. Like 5 star hotels around the world you could be in any city once inside one of these complexes where most tenants are just slaves to the landlord. A local told me the tap water in Londres was much freer of minerals and salts than that here in Belén. Londres was only 10km down the road. Like all Latinos, the Argentinos are really friendly and always helpful. Anyway in Londres I got talking to a lady at her farm house about the walnut orchards there. 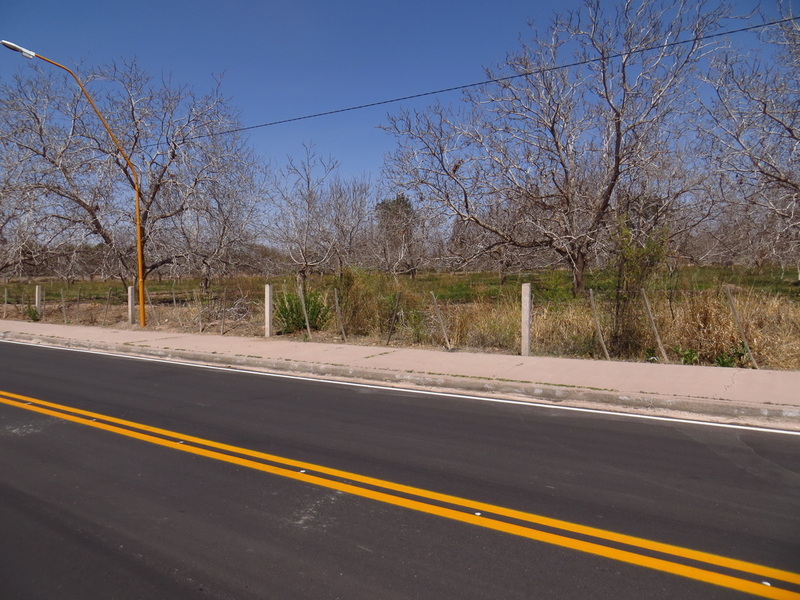 Walnut groves grew on both sides of the road approaching town. The water was totally forgotten about.. Heading out of town it was remembered. I needed some for the night. At a religious monument on the roadside by a dry riverbed were a couple of cars. The people had driven out here to pay their respects to Santa Rosa. She keeps people safe on the road. Some people were approached for water, they had 5 litres in a container, we transferred it to my bladder. Their car was an old Peugeot, I had to help them push it to get it going. These kinds of gestures from ordinary people go a long way in providing inspiration for many kilometres ahead. It was always going to a laid back low km day. 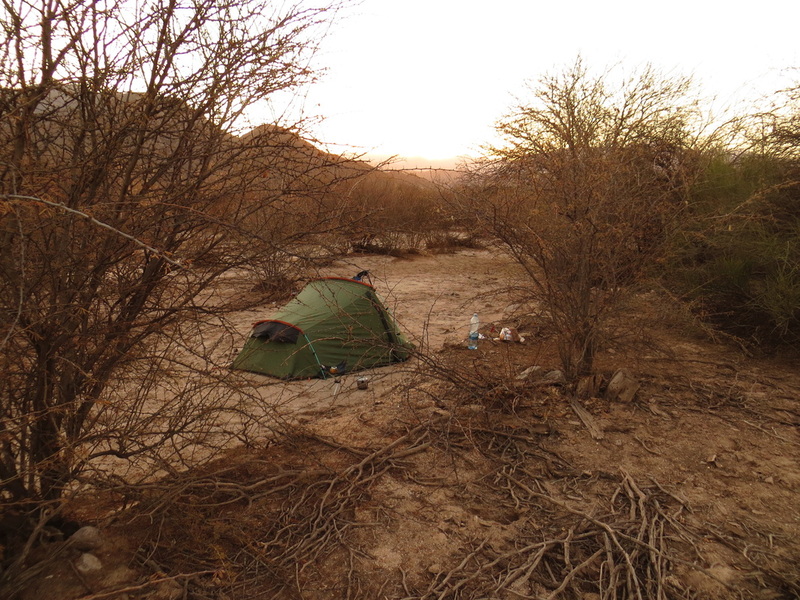 Both sides of the road were vegetated with low dry thorny Acacias and other arid region plant dwellers. Almost every tree and plant has thorns. A hazard, to belongings that are inflated with air, i.e. airbeds and tyres. Finally access off the road was found, it lead me to a small dry sandy creek bed. These are perfect spots as the sand is soft, clean and thorn free. No one had used the track for sometime, this was evident by the weathered tyre tracks. It was early, it was time just to hang about and take my time. It is so nice to be wandering around barefooted on sand again. Dinner of pasta and salmon with tomato puree was enjoyed. The day, though the sun was hot, was chilled with a bitterly cold wind, someone told me this is normal after a day shrouded in dust. Ample firewood, private and thorn free. 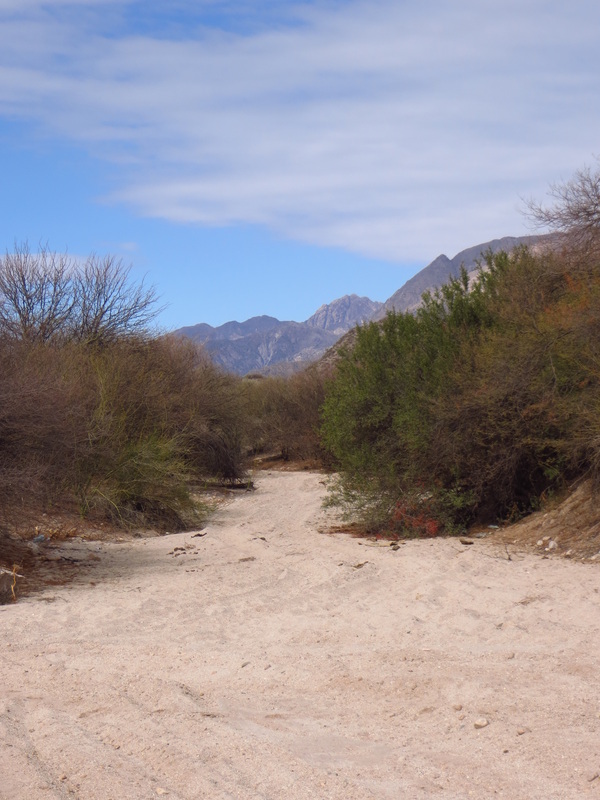 Typical of dozens of dry creeks crossing under the road, at times draining the range behind.